As 19th Century Leamington metamorphosed from village into prestigious spa town, and eminent medical men advised exercise in addition to taking the waters, many sports associations sprang up here. Leamington could boast a Real Tennis Club, the first venue for Lawn Tennis (on the site of the present Manor Court flats) and an extensive Polo Ground south of the river. Leamington became famous for Croquet and Archery. There was a Cycling Club, and from 1890, swimming at the new pool designed by William de Normanville, the Borough Engineer. Cricket was also a popular sport. On at least two occasions, in 1863 and 1882, Leamington almost became the home of Warwickshire County Cricket Club. 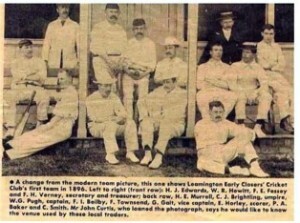 The present Leamington Cricket Club was founded on 21st February 1899 at the instigation of the Mayor, G L Bland, on land at Arlington Avenue owned by Sir Wathen Waller. 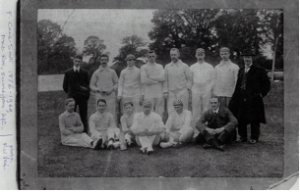 Prior to 1899 there were many Leamington cricket teams, but not an established Leamington club with its own ground, officers and facilities. A Leamington cricket eleven played on a ground near Newbold Comyn. In July 1829, for example, they played against the gentlemen of Rugby School. One of their games, against Coventry in August 1833 had to be abandoned when a dispute caused the Leamington players to be attacked by a mob of 400 people. A Cricket Club proper, with Lord Leigh and Mr E J Shirley as joint patrons, was formed in 1848. But it was dissolved in 1850, as England players and professionals George Parr and John Wisden’s new club at Victoria Park came to the fore. 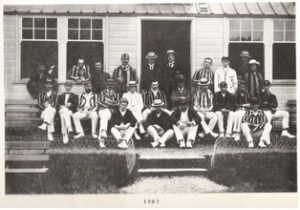 Parr and Wisden were notable contributors to the then Leamington CC fixtures until 1863, when Wisden left Leamington to pursue other interests, including publishing. Parr stayed on as tenant of the ground until it became Victoria Park, and archery took over. Over a period of ten years, from 1870 to 1880, advertisements appeared regularly in the Leamington Courier, appealing for interest and support for the establishment of a ‘good’ club. Meanwhile, a Leamington cricket club continued to play, first at Leam Terrace East on a ground shared with the Alliance CC and the Early Closing CC, then from 1880 at Avenue Road. Not all these clubs stayed the course, but whilst active, they could boast a distinguished group of clergymen who could fulfil the roles of President and Vice-President. They included the Reverends HL Maud, A Sewell, WC Furneaux (Vicar of All Saints), WG Wise (Vicar of St John’s and a member of the Wise family of Shrubland Hall). What is not known is whether these gentlemen ever actually played cricket, or whether they simply sought to protect their flock from ‘the dark haunts of vice and misery’ (D Birley, A Social History of Cricket, 1999, quoting Rev James Pycroft, The Cricket Field, 1851). Gambling on all kinds of sports was rife at that time. It was not just a pastime for leisured wealthy men, it was a source of income for some whose only skills lay in the sport (D Birley, A Social History of Cricket, 1999). There is no mention in the present club archive of ‘vice’ or ‘misery’ except when weeds appeared on the hallowed turf of the square, or Leamington lost a key game against local rivals.